Dew (left) and Else (right) vases. 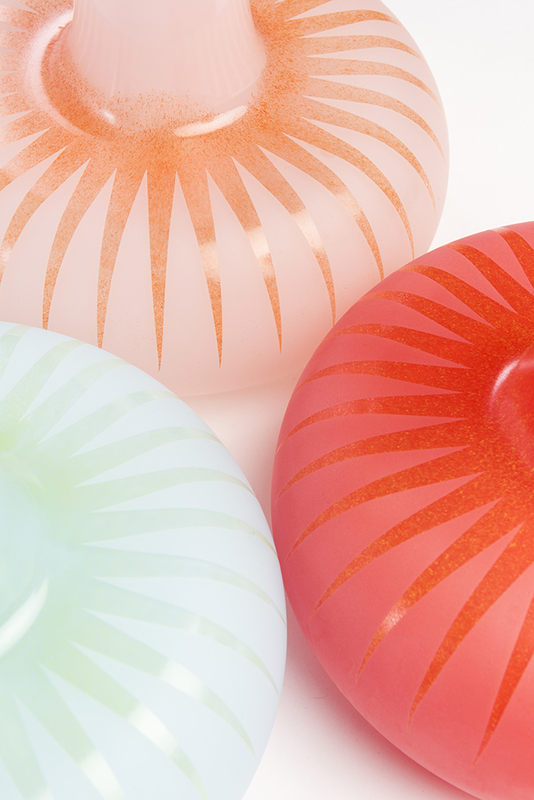 The Dew vases are coloured on the inside and have sandblasted stripes on the exterior. This creates shadows inside the glass wall, adding depth and texture to the monochrome colour. 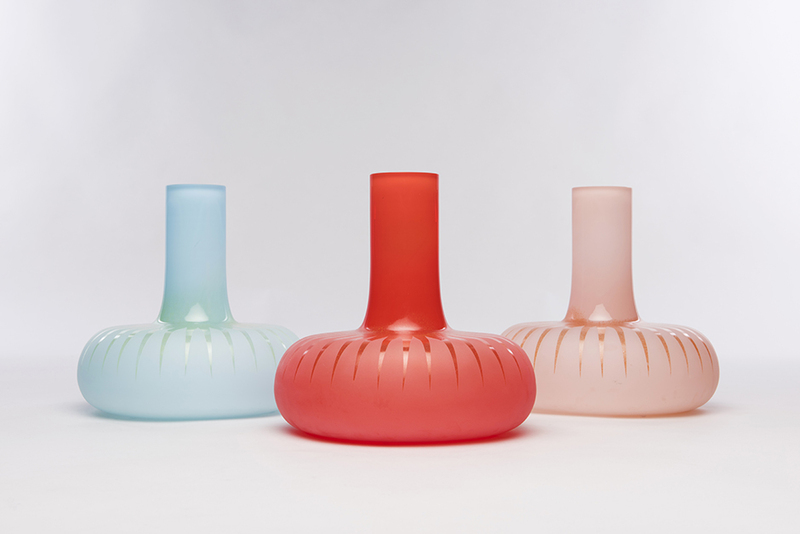 The vases are mouth-blown by Norwegian glassblowers at Magnor Glassworks. The Else vase by Kristine Five Melvær has a graphic motif draped around the vase neck like a bold piece of jewellery. The motif both emphasizes and challenges the shape of the object. 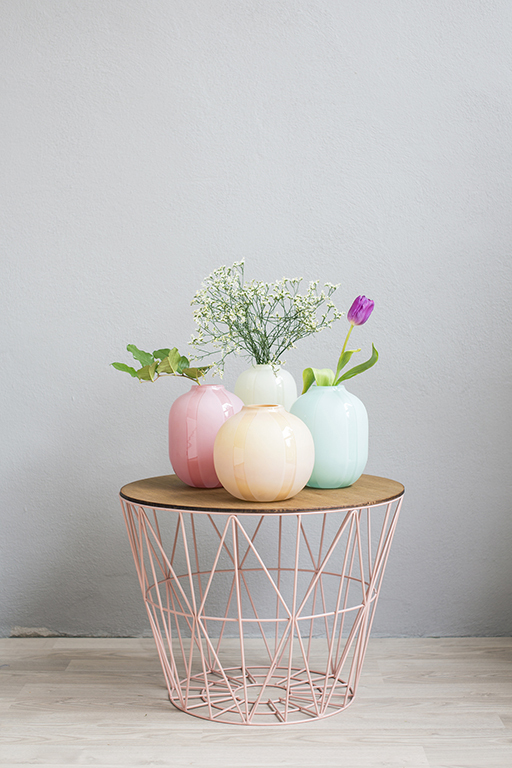 The vase explores subtle colour differences and the contrast between glossy and matt surfaces. The upper part of the object shows the glossy top colour, while the lower part is sandblasted. Kristine Five Melvær (b. 1984) is an Oslo-based designer working with tableware, lighting, furniture, textile objects and graphic design. She investigates the subject of object communication, bridging the disciplines of product design and graphic design. She focuses on the communicative potentials of objects as a means to create emotional bonds between object and user. By searching for the sensual essence of phenomena, she translates these qualities into sensuous objects with a Scandinavian simplicity. Trained in industrial design at the Oslo School of Architecture and Design, and visual communication at the Oslo National Academy of the Arts, she is an award-winning designer of tableware, lighting, furniture, textile objects and graphics. She is one of the biggest contributors of new designs to the Norwegian glass manufacturer Magnor Glassverk, and typically focuses on the communicative potential of an object to create an emotional bond with the user.